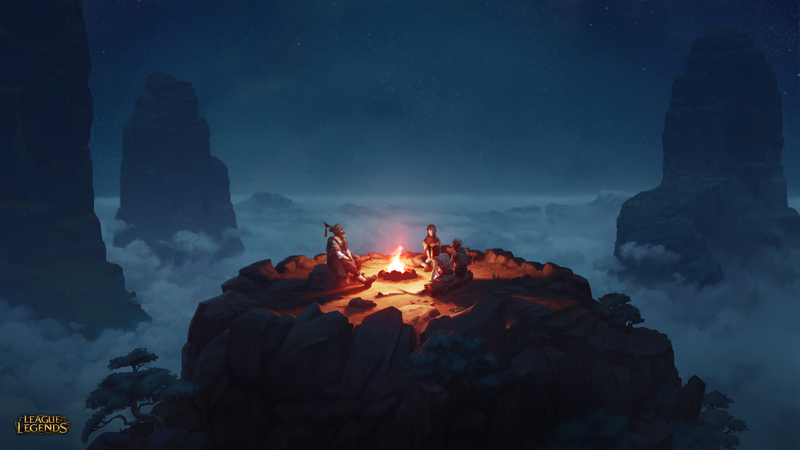 Riot Games is dropping hints about a new champion for League of Legends with a cryptic tale told over a campfire on the top of a tiny mesa. "Stories are not just history. They can be so much more," the preview site states, as nightbirds call in the background. "They nourish your mind and, if told well, can even fill your belly. Some tales are warnings, reaching across time. Others uplift our souls from the yoke of everyday burdens. We laugh at fools, cheer heroes, and curse villains until the fire burns down to embers." It goes on like that for awhile, with references to the Frozen Watcher, the Fall of Shurima, and the Shattered Crown, none of which offers a whole lot of insight to casual observers. The final page is equally enigmatic, but it does at least offer a vague hint as to what's coming. "There was a time, not long ago, when this constellation was absent from the night sky," it says. "Some call it the Mountain Shrines or the Great Caretaker. Those of us from the floating villages know of an older name, a name that speaks of a universal truth. The name we took from our kind: Bard." Predictably, there is much speculation underway, but little in the way of consensus: Mount Targon or Ionia, Jungler or Support, Aatrox or Ao Shan, nobody knows, and for now, Riot isn't saying. There is, however, a Wonder Above wallpaper, dug up by PCGamesN, that I think we can all agree is quite lovely. Get it here.